This tour is fully catered with all kayaking equipment provided. 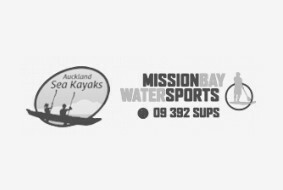 We kit you out with all the specialist paddling gear including buoyancy aid, spray skirt, spray jacket, thermals and a dry bag for your camera. The Islands in the Hauraki Gulf provide sanctuaries for native plants and animals. We want to keep it this way. “Our company is licensed by DOC and the Auckland Council to visit islands in the Hauraki Gulf"
• Check your bags for stowaways: mice, rats, Argentine ants and rainbow skinks. • Ensure your footwear, clothing and bags are clean and free of soil and seeds. On arrival at Rangitoto Island, which is the largest and youngest of Auckland's volcanoes, you will start the leisurely 1hr walk to the summit. Walking up the pohutukawa-cloaked island gives you the chance to explore the baked scoria rocks which support over 200 different native trees and flowering plants. Upon reaching the top you will be treated to the finest 360 degree views that the Auckland region has to offer. At the return to the water's edge, a healthy hearty kiwi lunch will be awaiting you, with cold and hot drinks to match! If time permits, you might even enjoy a refreshing dip in the sea before the gear is packed back into the kayak to head home. As you kayak back south, perhaps with the help of a sail, you arrive back safely at St Heliers Bay. An exciting, action-packed and educative day for all! We kit you out with all the specialist paddling gear including buoyancy aid, spray skirt, spray jacket, thermals and a dry bag for your camera. This tour is fully catered so please advise us of any dietary requirements. On arriving at Browns Island, you will be given the chance to walk to the summit, which will give you an opportunity to experience spectacular views and the island's fascinating history. There are three pa sites on the island (Maori fortified village), with the largest occupying the slopes of the main scoria cone. Light refreshments are provided on the island before you head back to the sheltered waters from where you started. 4 hours. Add 30 min each way if transport from the Auckland Ferry Building is required. This is what sea kayaking is about! Two days out on the water, away from crowds and getting in touch with nature again. There is no better place in the Auckland region to start your kayaking tour than on the calm waters of the Tamaki River. As you paddle away from the crowds of the city, the diversity and beauty of the Hauraki Gulf will open up before you and time will slow to nature's pace. As you leave the Tamaki River, you will have a chance to visit Browns Island, where you will enjoy lunch, before heading to the jewel of the Hauraki Gulf, Motuihe Island. Motuihe has some of the best sandy beaches of the gulf islands and these together with its clear waters and sheltered anchorages make it a stunning place to stay the night. Motuihe is a natural sanctuary which is free of animal pests and home to the endangered New Zealand dotterel, saddleback, kakariki, kiwi, shore skinks and bellbirds. The diversity of rare birds, its location and natural beauty makes Motuihe a kayaker's dream destination. As night falls, you will enjoy a night of true kiwi camping on the north-eastern side of the island with all the gear you need being provided. From the campsite, you will have the chance to enjoy picturesque views over the Gulf, including Rangitoto and Motutapu, and watch the sun set over Auckland City. On the morning of day two, you may have the chance to explore a little more for of Motuihe Island before taking down camp and heading over to Rangitoto, from where you will take a leisurely walk to the summit to experience stunning 360 degree panoramic views.Following lunch, you will then return to the sheltered water of the Tamaki River where you will once again meet the van which will take you back to the city.